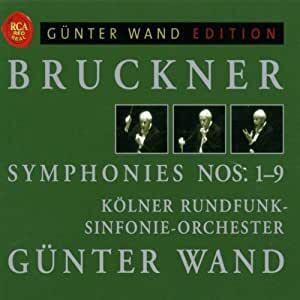 Günter Wand (1912-2002) recorded this complete cycle of Bruckner symphonies from 1974- 1981 with the Kölner Rundfunk-Sinfonie-Orchester (now called the WDR Sinfonieorchester Köln), and it established his reputation as a leading Brucknerian throughout Germany and worldwide. From 1982 to 1990 he was Principal Conductor of the NDR Sinfonieorchester Hamburg, and he made acclaimed recordings with that orchestra, including Bruckner's Eighth and Ninth Symphonies at the Lübeck Cathedral. On that basis, he was invited to Berlin every year from 1995 to 2001, resulting in recordings of Symphonies Nos. 4, 5, 7, 8, and 9 in the Berliner Philharmonie (now collected in a box.). By comparison to those with the Berliner Philharmoniker 20 years later, these WDR performances are swifter, punchier, and grittier. 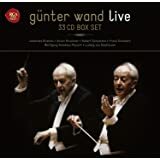 Wand's tempos are in line with those of Jochum's Sixties Bruckner cycle recorded by DG and with Karajan's contemporaneous Seventies cycle with Berlin for DG, while the later recordings are generally more expansive. The Berlin musicians produce a suave, elegant sound for the older Wand. 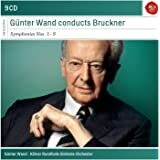 Wand was already in his Sixties at the time of these Köln recordings, but this is a more vigorous and muscular Bruckner. Strangely, Wand was only ever a guest conductor for the WDR Sinfonieorchester. From 1939 until 1974 he was the Music Director of the Köln Opera and its Gürzenich Orchestra. 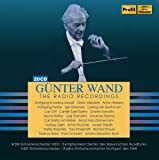 The listener would not suspect that Wand's relationship with the WDR orchestra was any less profound than his relationship with the NDR orchestra, which produced later cycles of Beethoven and Brahms symphonies for RCA. These are superb recordings of powerful performances! Not long after I acquired this bulky box of nine discs in eight jewel cases, enclosed in a cardboard shell, Sony reissued the set in a Brilliant-style box sans jewel cases, which is cheaper and fits more easily on your CD rack. Now, Wand. I came very late to the work of this maestro, as I had also done with Bertini. 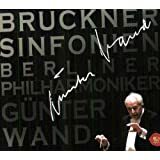 After buying Wand's Bruckner recordings with the NDR (another world-class orchestra) on a whim, I was amazed at the clarity, command and intensity of his readings. Don't be fooled by the amiable grandfatherly photos of the conductor: his heart, mind and spirit are not arthritic! After purchasing and listening to Wand's Schubert, Beethoven and Brahms symphonies, I am convinced that this man deserves to be considered among the greatest conductors of all time. This is not a Kappelmeister--in the pejorative sense--approach to music. His performances are always involved, individual and --thank God--well rehearsed! 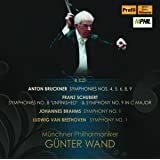 Even though Wand's Berlin recordings of Bruckner (4, 5, 7, 8 and 9) are often singled out as his best recorded Bruckner, I must absolutely disagree. They are good, very good, but nowhere as bracing as his Cologne and NDR versions. While the Berlin performances are quite beautiful, the overall impression is slightly static, somewhat careful, and noticeably slower (most of the time confused with profundity). Compare the 5th, 7th and 8th symphonies with Cologne and NDR, with the ones from Berlin--for me, the difference between "alive" and "artistically embalmed." I passionately recommend this reviewed set to anyone who loves Bruckner. If you are able to find it, I also encourage you to listen to Wand's NDR (live) cycle (Nos. 3-9 only). I guarantee that you will soon be collecting Wand's other recordings in due time. 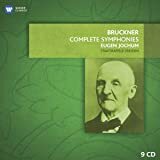 My order of the Wand Bruckner complete symphonies came as ordered on 10 CDs. My order was well packaged but I failed to notice that these 10 CDs are each in their own cd case instead of perhaps 1 or 2 CDcases that would hold possibly 4 or 5 CDs. But I am thrilled to have this set in my collection of the great masters. Wand is a great, reliable Bruckner conductor. Seems he recorded the symphonies three times. I know there is an NDR set, there is the Cologne set and then he did them in Berlin. I wonder if RCA will ever issue syms 1,2,3 and 6? His Bruckner is clear and reliable. He does not quite have the sense of mystery that Furtwangler does. Furtwangler's 9th is one of the great Bruckner recordings of all time. Still, Wand has great command and his readings are worth hearing. Only close to Furtwangler is the hard to get set with Eichhorn on Camerata. The elderly Eichhorn was a fantastic Bruckner condutor. Too bad his Camerata set is virtually impossible to get.